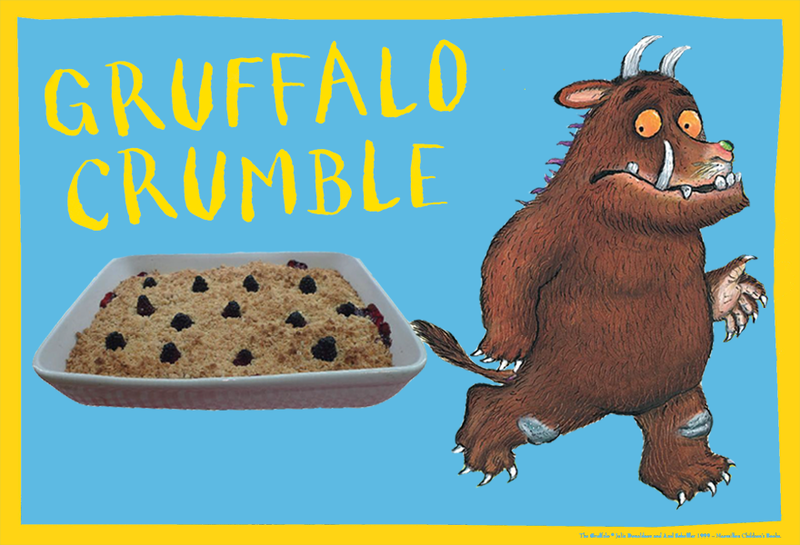 A Gruffalo-themed recipe for adults and children to make together from Julia Donaldson's fun-packed cookery book Gruffalo Crumble and Other Recipes. 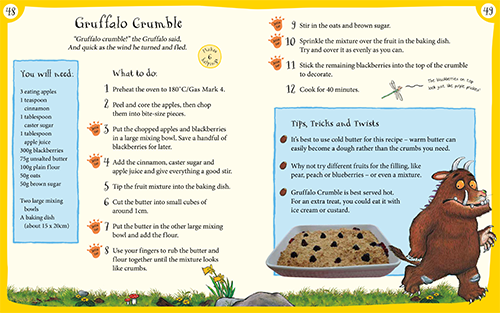 Julia Donaldson's Gruffalo Crumble and Other Recipes is packed full of sweet treats, healthy snacks and simple meals - all based on the bestselling picture book The Gruffalo by Julia Donaldson and Axel Scheffler. 2. Peel and core the apples, then chop them into bite-size pieces. 3. Put the chopped apples and blackberries in a large mixing bowl. save a handful of blackberries for later. 4. Add the cinnamon, caster sugar and apple juice and give everything a good stir. 5. Tip the fruit mixture into the baking dish. 6. Cut the butter into small cubes of around 1cm. 7. Put the butter in the other large mixing bowl and add the flour. 8. Use your fingers to rub the butter and flour together until the mixture looks like crumbs. 9. Stir in the oats and brown sugar. 10. Sprinkle the mixture over the fruit in the baking dish. try and cover it as evenly as you can. 11. Stick the remaining blackberries into the top of the crumble to decorate. 12. Cook for 40 minutes. Gruffalo Crumble is out now in Hardback!